It makes sense: Forty, a tad rotund, cardio goal met by the effort it takes to force down the netting of my French press. I look red and beefy all the time. After taking a moment to say goodbye to my immediate family, I laid down on my couch to die. Several minutes passed. My wife finished the episode of "Sabrina the Teen Witch" she was watching on her Kindle Fire and asked me how my heart attack was going. "It's pretty bad," I wheezed, "but not like how Fred Sanford used to describe them." "Well, it doesn't matter. He's dead, and I am coming to join him." Even at the prospect of my expiration, her face was neither here nor there. "Did you take some Tums?" "Tums are chalky," I whined. I didn't really say that, but it is a very accurate description of Tums. Instead I chewed some Tums. My heart attack stopped about fifteen minutes later. Having almost died, I feel like I have a new perspective on life. Air smells sweeter and other crap like that. We've been talking about new boots for twenty minutes. Regna, the 23-year-old woman standing in front of the class, rocks back and forth as everyone admires her footwear: black leather boots with glass beads lining the sides. Tales of boots bought or found, loved and lost, worn out to time or the salt laden sidewalks of Michigan winters. Boots, boots, boots. The absurdity of a word said repeatedly. People's mouth shapes as they say it. Boooots. All those mouths making oooooohs. The next person to say 'boots' will be my enemy forever. Regna is blind, and uses one of those red and white collapsible canes to navigate her world. I say "her world" to sound more professional, just like I employed person-first language when I said "Regna is blind", as opposed to the much more offensive "Old blind Regna." Our classroom is very small, and unfortunately, as Regna goes navigating, she trips many of the people living in her world. The humor of it is so cliché, so tired: a blind person sending others flying by whacking their shins with her cane. But it's real. It happens every day. And each time, as I hear another "WHOAH!" or "MY LEG!" and someone crashes to the floor with a great commotion, I hate myself for laughing. A girl got up to announce her birthday party to the class. There were red marks all over the front of her pants, and everyone began to scream. "It's period!! She got period on her!!" The girl smiled and assured us all that it was just blood from a bug she had killed. Later it occurred to me that her explanation would only make sense if she had squashed the bug by purposely laying on it, which seemed unlikely. Being the safety conscious, responsible teacher's aide that I am, however, I went with her to find a change of pants. "Mike?" she asked me, once we were alone. "Does your wife....does she ever....have the blood? You know....of the month?" "I thought you said it was from a bug." "Oh it is, it is." Her eyes searched my face to see if I believed her. 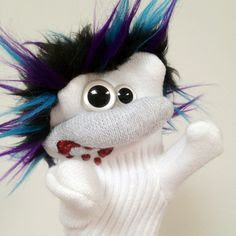 In my never-ending search for companionship, I recently bought a puppet. There's something so classic, so timeless, about a good puppet. They've been with us since the days of ancient Greece, and I see no reason why they will not be there at the end; mute, googly-eyed witnesses to the last gasp of this wretched, dying planet. Puppet technology is always evolving, and we find ourselves now at the edge of what is known as "the uncanny valley". This means puppets have started to look too real. The little discrepancies in their human-like appearance stand out to us as jarring, somehow off, and make us uneasy. 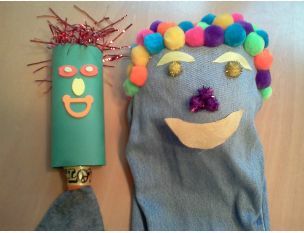 The intimidating thing about puppets is that their personalities are only as good as you make them. Garbage in, garbage out. I was worried that mine might be a smug know-it-all, or a shameless lecher. Maybe someone with no social filter whatsoever. Was the African-American child featured on the packaging having a fantastic time with the puppet? Well, apparently this video is not working for anyone. What an anticlimax. I will try to figure out the problem. In the meantime, please don't leave me. About five minutes after shooting this footage, I grew really tired of my new friend and threw him down the basement stairs. That is the funniest thing you have ever wrote (so far): "In my never-ending search for companionship, I recently bought a puppet." - you need to get yourself an intelligent dog. I have 1 3/4 intelligent dogs (out of 2). Gween - I've been watching a lot of "Chopped," lately. Wait! There's more! Those chef-y people often speak of balance, of countering the sweet with the savory, the starch with the acid, blah blah blah. Well, in reading from BOOTS to PERIOD to LONELINESS, I find your dish *perfectly* balanced. Your worldview is a joy to behold. Thanks for capturing bits of it here. The friends of Mr. Cairo. Wow. Wow. Girl, will you be a woman soon?